So our circa-2005 kitchen faucet pooped out after 10+ years of heavy use. It wouldn’t swivel easily anymore. 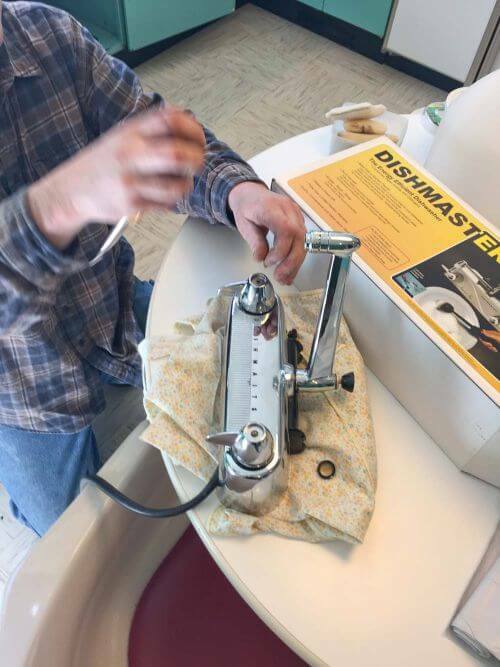 I am sure we could have ordered parts to fix the swivel, but instead, I decided to install the new Dishmaster M-76 Imperial Four that I’ve had stored for about eight years. 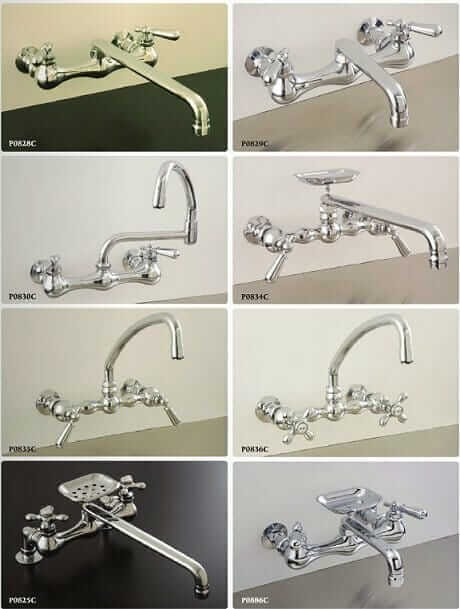 Yes: Dishmaster faucets are still made today! But then, I had two more ideas to hack the faucet further back into time — and they worked just fine! 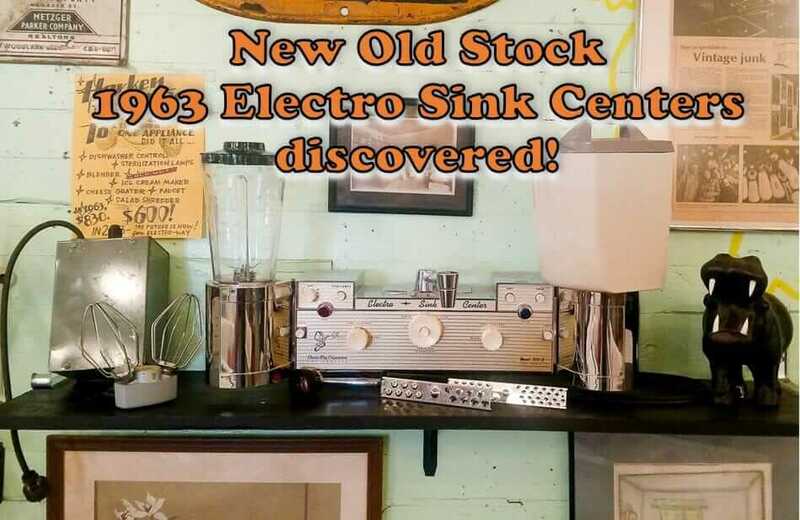 In 2013 I did a story about all the vintage faceplates still in stock and for sale at the Dishmaster factory in Indiana. (Photo from the factory, above.) Readers snapped them up in no time flat. I already had three in hand and used the silver one on my new M-76. Totally cool! 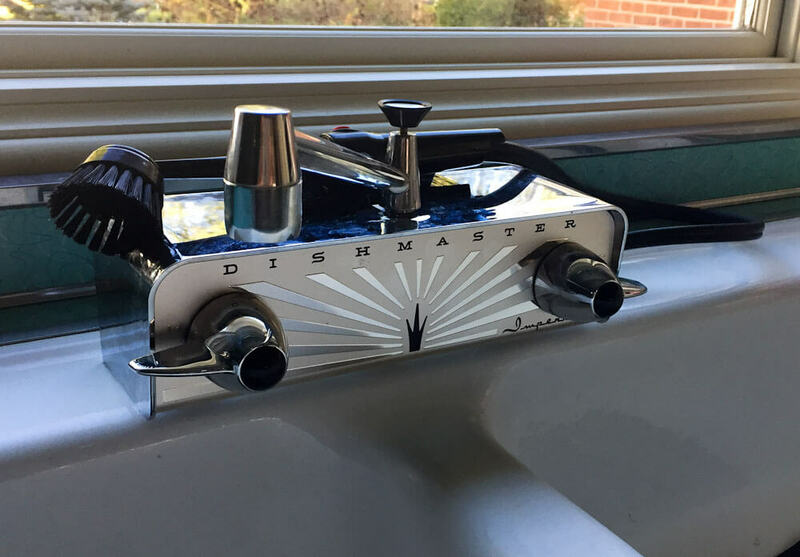 This idea was even more genius, I thought: I had my plumber take the lever handle thingies off my NOS very old Dishmaster, which I had scored at The Amazing Electrolux Salesman Estate Sale in 2010. There has never been another estate sale to compare! Note: My old Dishmaster seems to be a wall-mount model — although I am not really sure. It did not come with escutcheons, but maybe I could jury-rig those. Dangit. I did not think this through ahead of time. If it had been a clear-cut deck-mount model, I would have tried installing it — like Cullen did here! 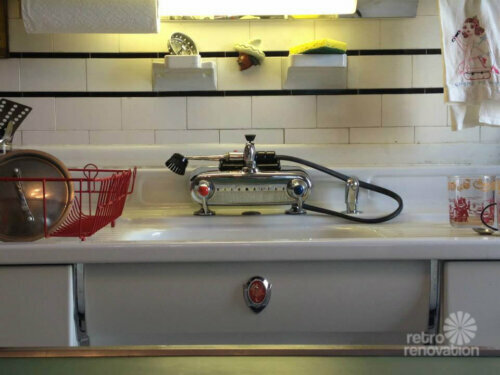 Note: The guts of old plumbing fixtures may not be up to current codes — for example, for lead used in their manufacture — consult with your own professional so that you can make informed decisions how to handle; for more info see our Be Safe / Renovate Safe page. My excellent plumber was totally game to play with me and knew just what to do: He popped the black rubber (?) thingies off the top, unscrewed the levers, then screwed them onto the new Dishmaster. 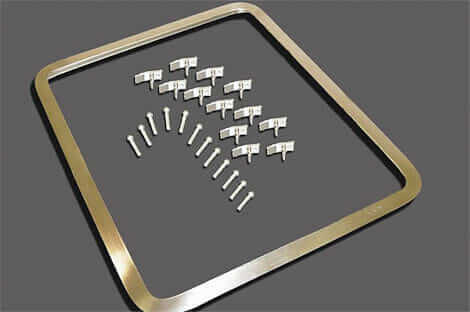 I believe he had to use the new Dishmaster screws, though, because the threads were different. Popped the black rubber thingies back on and voila! An even older look. Note: The levers that come with the new Dishmaster kind of stick out further, so that could be better ergonomics in terms of actually using the handles. On the other hand, the new levers [like the overall enclosure] are some sort of plastic with chrome plating, and although they seem nice enough to me, they don’t have the same heft — and certainly not the same groove factor — as the chromed pot metal (I assume) handles from my yee-old Dishmaster. My yee-old Dishmaster is basically so heavy you could use it as a weapon. 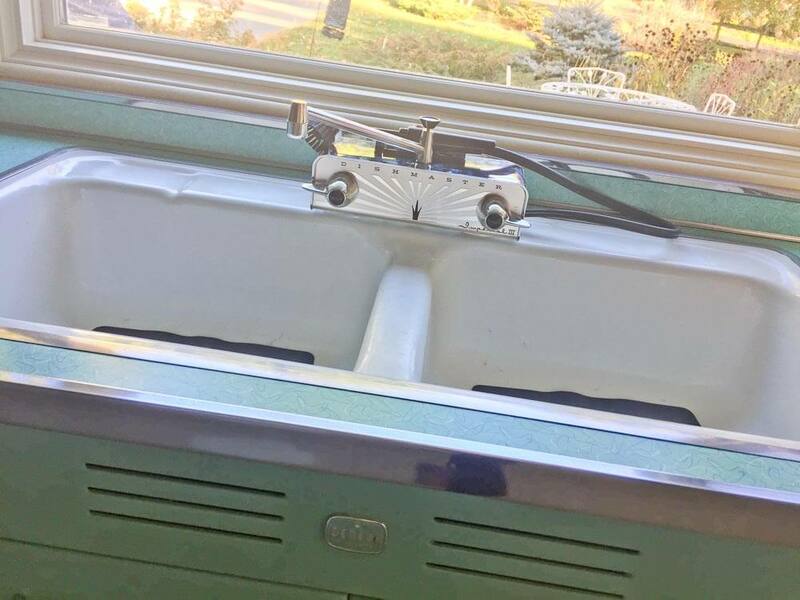 So, improvising on the spot, my good-spirited plumber shimmed the thing with some hardy plastic thingies he had in his truck… he fussed to get it right (while I tried to help but basically just got in the way. When all was said and done: The Dishmaster tightened down nicely, pretty darn level. He then he filled in everything with silicon. If you really get your nose under the housing and squinch, the silicon is ugly globby. 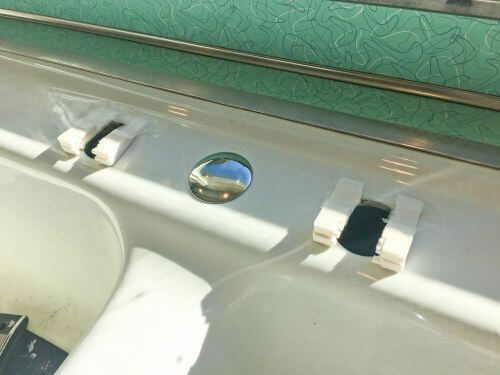 With more time we (I) might have crafted a more elegant solution [a homemade shimmed plastic escutcheon, perhaps?] But I was paying by the hour. It’s done. Perfectionist me let it go, for now, at least. When Dear Husband got home, he LOVED it. He didn’t notice the shimming at all. And moreover: I. Love. Using. The. Dishmaster! It is so fun! There’s a little plastic holding tank underneath the wand thingie. You fill the tank with a tablespoon of liquid cleaner [Dishmaster’s special blend recommended] and top with warm water. When you want to use the want, you pull up the black diverter. Don’t push the red button on the wand, and the water runs clear. Push the red button on the wand, and sudsy soapy water comes out the wand. It’s kind of splashy until you get the feel for it. And I probably would still use my Dobie to clean really tough crud off of pots, for example. But like I said, for plates and glasses and silverware and the like: The Dishmaster is super fun — and seems to be effective — to use! 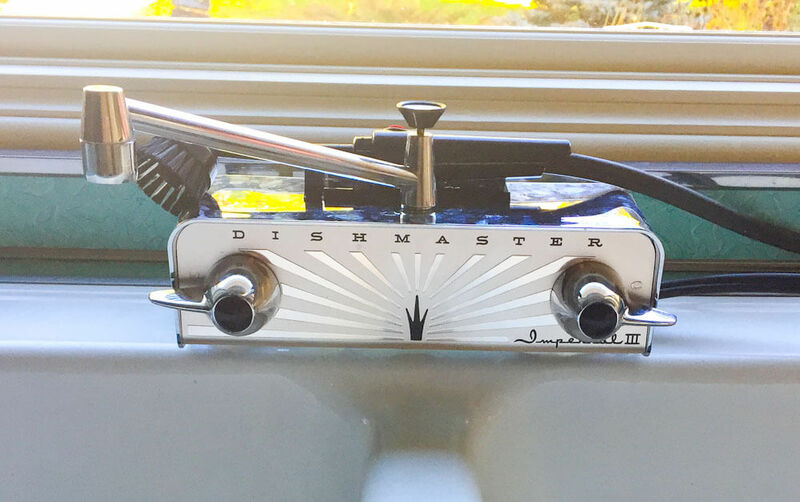 Read all our Dishmaster stories here. I’m dying for one of those faceplates! I’ve searched high & low! Anywhere that sells them? 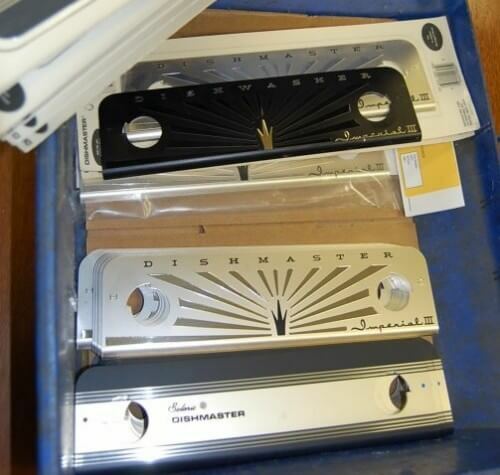 If you haven’t got one yet Jenn, contact Dishmaster as they have just released more vintage faceplates. They aren’t cheap though. Just wish they’d reproduce the bullet-style all metal valve handles.